Fender have brought out some great clothing, accessories and gifts over the years, all of which are extremely high quality, long-lasting and great ideas for a slightly different birthday or Christmas present! Commemorate Fender's rock 'n' roll legacy and more than 60 years of time-honored guitar craftsmanship with a modern, strikingly fashionable ladies tee with loads of attitude. 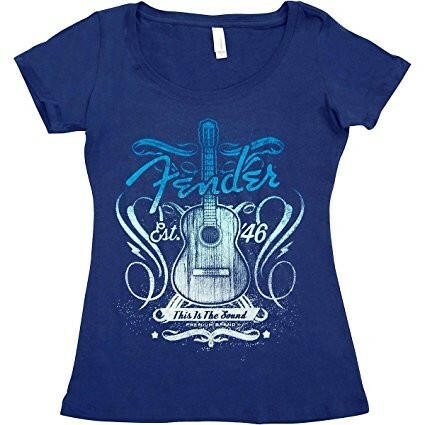 This scoop-neck tee celebrates Fender's acoustic legacy in its fun, decorative design with classic worn-in fee. Available in large only.